It seems Hollywood has always had somewhat of a love affair with the works of British author Charles Dickens. Take, for instance, his Victorian masterpiece Oliver Twist. Since the early part of the twentieth century, the novel has been made into a feature length movie no less than twelve times, and an additional three television mini-series. The classic tale of a ragged orphan who was born to poverty, becomes a pick pocket and thief, and subsequently rights his own ship with the help of some unlikely friends provides an inspirational theme which rings true to any generation. 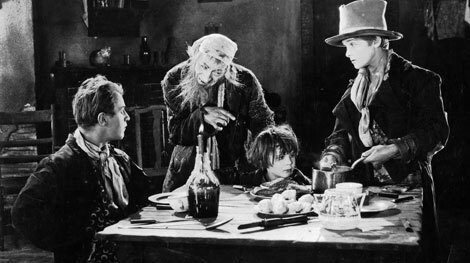 Although there are several silent versions of the film, perhaps the most iconic is the 1922 release starring Lon Chaney as the evil Fagin, and then child superstar Jackie Coogan in the title role. Coogan, whose career had really taken off the year before in the Charlie Chaplin masterpiece The Kid, was an 8-year-old phenomenon, and fast becoming one of the most popular actors in the country. He would go onto a successful screen career as an adult up to, and concluding perhaps his last role as Uncle Fester on the 60’s TV series The Addams Family. As for Chaney, he was already entering the height of his popularity, and a year later would become a superstar in the screen adaptation of the Victor Hugo classic The Hunchback of Notre Dame. For this Dickens film, the pairing of the two seemed logical, and the movie was a great success. To set the scene for the classic, organist Bob Whiteman will present his original musical score on the McKinney Performing Arts Center’s Mighty Wurlitzer theater pipe organ. Bob is no stranger to MPAC audiences. He has provided entrance and exit music for numerous MPAC shows, and has worked with the McKinney Repertory Theater on various productions for the past several years. In his earlier years, Bob was the keyboardist for singer Frankie Laine, and at one time was the stadium organist for the Cleveland Indians baseball team. The program will be presented Saturday, Jan. 10 at 7:30 p.m. Adult tickets for the event are $12 in advance, or $14 at the door. Kids tickets are priced at $5 in advance, or $7 at the door. Seniors over 65 are admitted free, but tickets are required. Reservations can be made by calling the McKinney Performing Arts Center box office at (214) 544-4630 .